Baby Cough: Why Is My Infant Coughing? A baby cough, just like an adult cough, helps protect the body. Coughing can help to eliminate excess mucus, clear the airways, and help when food or liquid goes down the wrong pipe. An infant cough can be either dry or wet. 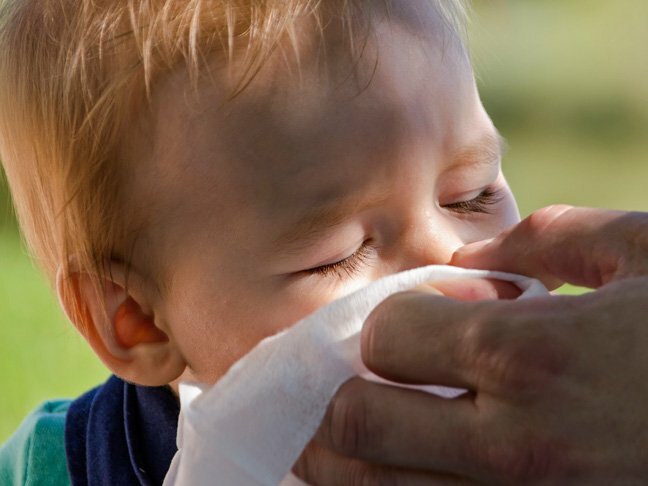 A dry baby cough usually occurs when a child is suffering from allergies or when the baby has a cold, as coughing helps clear a postnasal drip. Wet coughs occur when there is a respiratory condition that involves a bacterial infection and there is mucus in the airways. Here, we reveal the most common types of coughs in babies — and what to do about each one. If your baby has a cold, there can be a dry, hacking cough or one that is wet with the sound of mucus rattling. The flu can also cause a wet cough and a fever. If the baby has a fever higher than 100.4 and is younger than four months, immediately call your doctor. Acetaminophen or ibuprofen are both safe medications to give babies for fevers; however, avoid giving babies cold medication. Croup causes a barking cough and difficulty breathing. It tends to affect children younger than five and starts with a sniffle or cold. To soothe a baby cough from croup, use a humidifier with cool mist or take your child into the bathroom and run a hot shower so that the baby can breathe in the steam. Coughs from pneumonia are wet, and there may be wheezing as well. It’s important to see a doctor to determine whether the pneumonia is viral or bacterial in your baby as the latter is more dangerous. Bronchiolitis is usually caused by RSV in babies under one year old. The RSV virus can be very serious in babies that young but is usually just a cold in those older than three. This chronic condition can develop if your baby has allergies or your family has a history of allergies and asthma. It can lead to dry or wet coughing and wheezing. If your doctor determines your baby has asthma, you can get treatment in the form of liquid albuterol to be administered through a nebulizer. Also known as pertussis, whooping cough can be deadly in babies. Coughs are loud and sound like a “whoop.” You may also notice facial discoloration, bulging eyes, and your baby’s tongue sticking out. To prevent the illness, you must immunize your baby. Three doses of vaccine are required. If you believe your baby has whooping cough, immediately dial 911. A piece of food can get stuck in your baby’s throat, causing a cough. If you notice a sudden coughing, take a look inside your baby’s mouth.